Lasergame Rotterdam is suitable from 6 years old. This arrangement is possible on Wednesday between 13:00 and 17:00 and on Saturday and Sunday between 11:00 and 13:00. A long time ago, pirates ruled the sea. Human beings started shivering as soon as they noticed pirate ships on the horizon. The pirates of today don’t use canons but laser jets. On the junior kids party you and your friends will conquer the submarine. You rule the sea. Test your sea legs and courage on this exciting pirate party!In two lasergame battles you can prove you are a true pirate! As pirates have to work hard and fighting on an empty stomach is impossible, we will give you some time to enjoy a slush puppy and chips.Are you the coolest pirate of Rotterdam? Find out and celebrate your pirate party at Lasergame Rotterdam! This arrangement is available on Wednesdays between 13 and 17 o’clock and Saturday and Sunday between 11 and 13 o’clock. The children’s menu will be served at Lasergame Rotterdam. One lasergame sessions takes 20 minutes, inclusive of 5 minutes explanation. 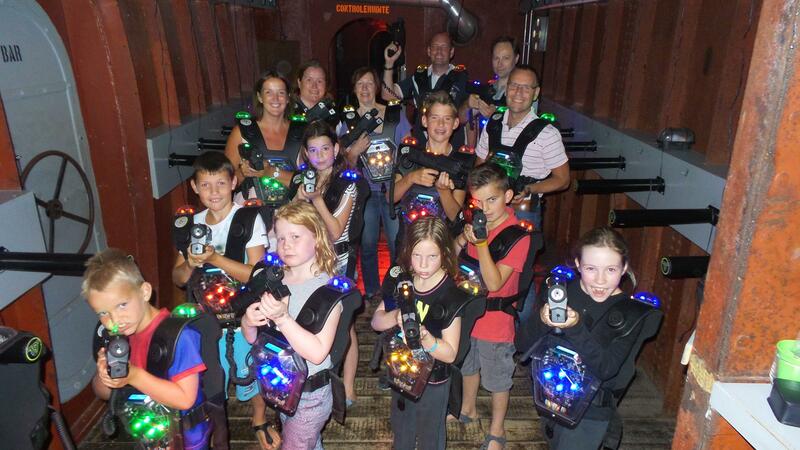 Please use the reservation form to fill out if you would like to book 1 or 2 lasergame sessions.